Although most of my collections are very inexpensive things; Fiestaware, western belt buckles, vintage Christmas ornaments, linen postcards…etc. My friend Lenny on the other hand, is a collector to the Nth degree. Pedigreed or not, he wants every one that he can find. It’s difficult to find a place to sit in his house, because there’s usually a crate of something fragile or a feeble inbred dog in every chair. In his almost half a century of life, he has crammed his 4,000 sft home with nearly 10,000 books, full-sized portraits of other country’s royalty, sterling silver serving pieces, Wedgwood, Russian icons, lead crystal, almost as many glass Christmas ornaments as I have, taxidermy, crucifixes, the wooden dollhouse I made in 7th grade, inbred Saluki, Limoges porcelains, dust mites, Faberge, VHS tapes, an assortment of objects once belonging to Malcolm Forbes, Franklin Mint collector plates, photographs of people who were executed over 100 years ago, and …….. most cherished by him……..his carved ivory brick-a-brack. 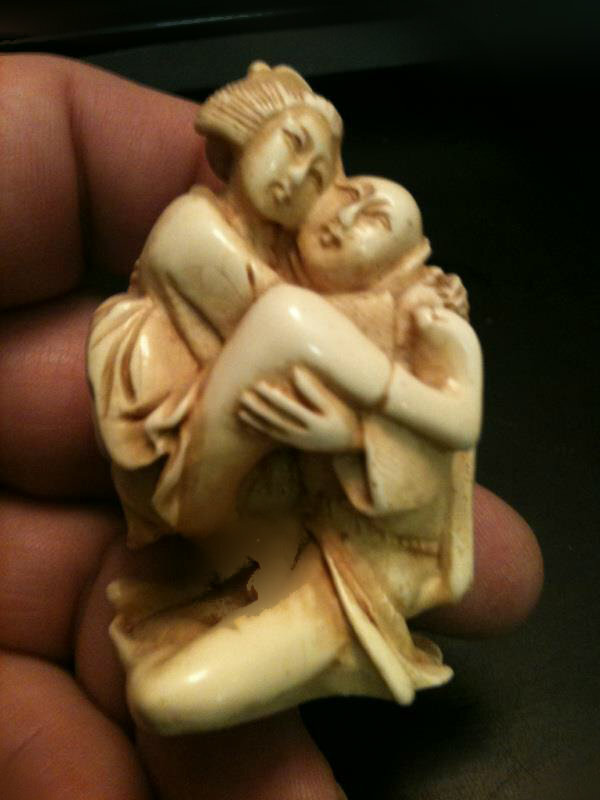 Years ago, he took me to an Asian import showroom at the Dallas Trade Mart to see an item he was contemplating adding to his ivory collection. The showroom was the sort where one had to manuever through human sized porcelain vases that could topple over with a misdirected breath just to make it 15 feet into the space. About 80 percent of the netsukes on this wall behind the overly attentive Chinese staff were doing just those kinds of things. But nestled smack dab in the middle of this wall of copulation, was a 5 inch tall ivory birdcage. “May I see that one,” Lenny pointed a sausage-like finger at it, and the oldest woman in the shop placed the cage on a black velvet pad before him. It was carved entirely from one tremendous piece of ivory, a wooly mammoth fossil I was later told because a piece this large would only be on endangered animals now. Because it was carved by an artisan who would only carve birdcages, as his father taught him…and his father before him; It takes about 3 years to produce just one. I couldn’t imagine how anyone could have a hand steady enough, or the patience, to make something so fragile and intricate. It was simply stunning. “I’ve never seen anything like it. And, ……..it opens”, Lenny slid a portion of the cage gently upward revealing the occupant of the delicate little prison…..well, I should say occupants…..because there were 2 of them in there, and we were intruding on a very private moment between an ivory man and his ivory wife. He looked at me with his furry eyebrows pinching together, “That’s the only problem I have with this thing”. “YOU WAN WOMAN ON TOP! ?”, was suddenly squawked from behind the counter in a mottled combination of mostly-English and Cantonese, and immediately there began a great storm of activity, and I assumed cursing, as the shop owner chirped at her much younger staff to quickly open every drawer and find a netsuke with the woman positioned on top. “Well, not exactly”, was Lenny’s answer. “I see”, she said slyly. “YOU WAN TWO WOMAN!”. Whatever it took to make this sale, she was gunna find it. And “2 WOMAN DOING IT!” was hurled over her shoulder in screaming Cantonese for all the assistants to deliver immediately. “I don’t think you understand.” he started to explain. “Oooohhh” she pointed to her wrinkled temple. Quite sure that she had him figured out now. “You wan 2 MAN!”, she bellowed out the “2 MAN!” part so that everyone in the showroom could hear her. And again the cursing and shuffling through drawers began behind the counter at break-neck speed to locate some silver dollar sized man-on-man action. “I want a bird”, Lenny injected into the buzzing crowd behind the counter. They stopped, and stared at him in disbelief. He thinks of that damn birdcage every time he sees it. I do so love your writing. Thanks Doris, I love you reading it. There are NO FRANKLIN MINT plates in my hiSTORY. ) Well… Maybe in the basement… But only bec some old lady left me all her stuff, and I cannot find loving homes for them. ). Sigh. Sausage like finger, indeed. The word I’m thinking of… Rhymes ..with… “Witch”. And I REFUSE to even dignify “half-a-century”. Though James is my old, old, old , old OLD friend. That is a great story. Good job! Thanks for telling it. I needed a good laugh and I agree with Doris. And to think that I thought my old keys and door hardware was interesting! Member the days of EBay exciting calls about our tin toy collections! Fun! Love everything the “Cavender Boys” do! All bias aside, they are my brothers-in-law, and the best EVER Uncles! Have you not heard that story before? Feels like I tell it all the time….. This is the best thing I’ve read in weeks. Oh my, that is so funny I can hardly stand it. Thank you for making me laugh out loud! But, he was okay with the ‘dust mites’, eh? Great story that was told with great finesse. I was laughing out loud (really, I was) and my children kept asking, “What is so funny, Mommy?” Aaaahhh, thanks for sharing. Now I want one. OMG….I thought I was going to pee my pants! Too funny! You tell a great story! I am innocent of these allegations. I read this out loud to the children and staff. They were most amused. My house-man, Robert’s favorite part was , “used by Chinese men to tighten their purse strings. (Something my friend Lenny has never needed accoutrement to help with) “. He said, ” I KNOW THAS RIGHT! HE KNOW YOU MISTAH LENNART!”. I did a spit take at “You have to go to Hong Kong for that!” Too funny! So glad that you liked it !!! Hope we keep you entertained…. You should write about Luz de Maria… And the Taco Bell de Muerte. Oh my! Love, love LOVE this story! Thank you for sharing it!